Looking for a pumpkin-y, chocolate-y, hearty grab-and-go breakfast or snack that’s perfect for Fall? 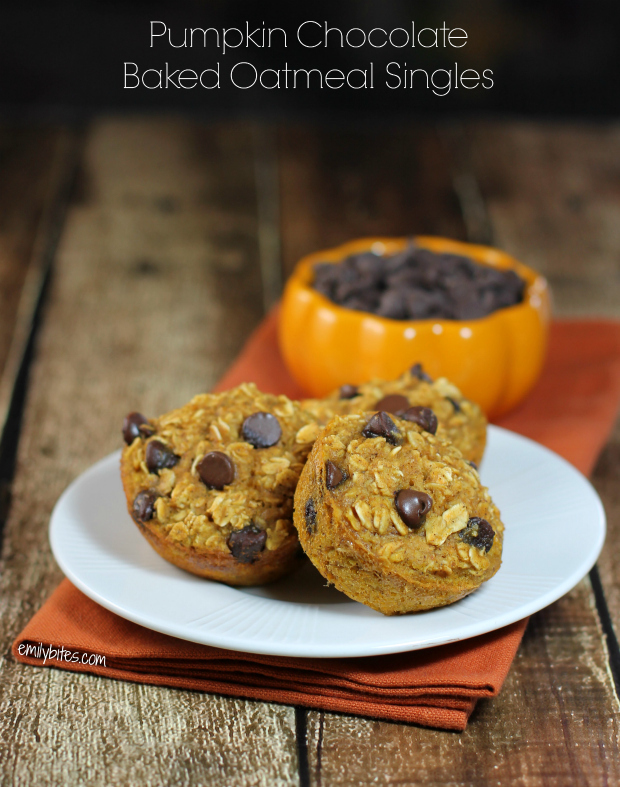 Look no further than these Pumpkin Chocolate Baked Oatmeal Singles! As many of you know, I absolutely love baked oatmeal, and ever since I realized I could make it handheld using muffin tins, it’s one of my favorite breakfasts. These come together very quickly and they’re a perfect treat to make on a Sunday and grab for breakfast throughout the week. 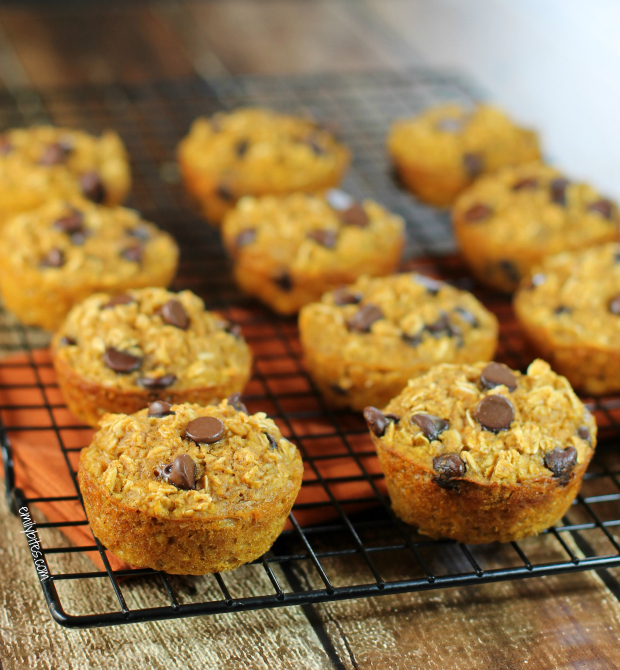 This particular version takes the yummy Fall flavors of pumpkin and pie spices and mixes them with hearty oats and decadent chocolate. At only 121 calories and just 4 Weight Watchers SmartPoints they’re a perfect combination of healthy and indulgent! Looking for more baked oatmeal recipes? Try Banana Chocolate Chip Baked Oatmeal Singles, Apple Cinnamon Baked Oatmeal Singles, Chocolate Cherry Baked Oatmeal Singles, Pumpkin, Cranberry & Apple Baked Oatmeal or Blueberry Peach Baked Oatmeal! Combine the oats, brown sugar, baking powder, pumpkin pie spice and salt in a large bowl and stir until thoroughly mixed. In a separate bowl, whisk together the egg white, egg, pumpkin, milk and vanilla. Add the wet ingredients to the dry ingredients and stir until blended together. Stir in the chocolate chips. Spoon the oatmeal mixture evenly between the prepared muffin cups. Bake uncovered for 18-22 minutes or until oatmeal is lightly browned and a toothpick inserted into the middle comes out clean. These sound amazing. Can’t wait to try them! Frozen pizza make me think about eating one almost every Friday night growing up. I don’t eat many of them anymore since I make my own, but these Culinary Circle Pizza’s sound good. YUM!!! I might make these this weekend since I am in love with all things pumpkin!! I have everything on hand except the chocolate chips, so I think I’ll leave those out and put in a bit of chopped pecans instead. Thanks, Emily! are these made in the mini muffin tin or full size?? Just made these and they are delicious! Thanks for another great recipe Emily! I just made these both for myself for breakfast and my 4 year old who is starting preschool tomorrow to take for snacks. They are really really good! Thanks for another great one, Emily! Just a wee comment to say thank you for this recipe. I made them yesterday and they are lovely. We don’t have canned pumpkin here in Scotland (at least, not in my local Asda!) so I just chopped and steamed a butternut squash which gave me three half cups of “pumpkin mush”. Likewise, I just mixed cinnamon, ginger and nutmeg for the pumpkin spice. I used cup cake, rather than muffin cases, and filled 12 nicely. I think these are so yummy I could even skip the chic chips, to be honest. Thank you for taking the time to make and post these recipes. Sooo good! Very filling, easy, and delicious! Thank you! I made these the other day. They really got the attention of my daughter who never feels like eating breakfast but who loves pumpkin pie. I think she might even like them better without the chocolate. I like them myself because they are so portable. I followed the recipe exactly and they turned out great. My batch just came out of the oven and they are delicious! Thanks Emily! I replaced the skim milk with Almond milk…delish. I made these and froze for grab and go. Truly delicious. They were so moist but not cake like if that makes sense. Thank you! Fantastic!! So easy to make and very tasty for only 3 points!! These are the bomb! I made them for myself to pop in my lunch bag, but my kids have gobbled them up. Thanks so much for such a healthy and yummy treat! Will be making these again and again this fall!!! Just made these — hot out of the oven! Sooooo good!! Lightly sweet and very satisfying! I just made these with GF Oates and almond milk, added a scoop of fiber and they are delicious. I used muffin liners and they stick a bit so next time I’ll grease the pan. Thanks for sharing! These look amazing. Could I swap raisins or pecans for the chocolate chips? Or just leave them out? These look great! I think I will add a tablespoon of ground flax seed and top with honey roasted sunflower seeds. Do these freeze well? Can Splenda brown sugar be substituted for brown sugar? I have never used Splenda brown sugar in any capacity before, so I really can’t say. Feel free to try it and report back! These are delicious! I’ve made them twice, and my husband even steals them. Great easy recipe! I used mini chocolate chips and added some dried cranberries. Really Tasty! Ooh, sounds yummy – glad you liked them! I’ve made these nearly weekly since you posted this recipe. Tonight I made them with cinnamon chips just for a change (same pts) and they are so good. This recipe is so easy. Thanks for making meal planning so pleasant! Can you substitute old fashioned oats for steel cut oats? I have never tried using steel cut oats in baked oatmeal so I can’t say – report back if you try it! I use old fashioned oats instead of steel cut in all the baked oatmeal recipes I’ve found and they work just fine. PS. Absolutely love the Pumpkin chocolate singles and the Pumpkin Cranberry Apple Baked Oatmeal. I use Gr. Flax seed for the eggs and coconut oil for the oils, and almond milk just to make them even healthier. Made these last night and they were a hit! I made them extra chocolatey by adding a scoop of protein powder, a bit of unsweetened cocoa powder, and a dash of chocolate PB2 to the dry ingredients. I also didn’t have brown sugar, so I used white sugar and honey sugar (dried honey crystals). Great dessert/breakfast and I have some in the freezer too! I made these in a 9×13 pan, rather than the muffin tin (was just making them for myself, so I wasn’t concerned about presentation), and baked it for about 30 minutes. Delicious as always! I love that it’s not too sweet. Easy to reheat for a quick breakfast. I just wanted to let you know how much I love these! I bake them every week and have one with a yogurt every morning (during the week) for my breakfast. GREAT recipe. They are helping me on my weight loss journey. So far I have lost 26 pounds ( in 17 weeks). Keep the great recipes coming! This was the first recipe I made from your site and they are amazing!! So good and such a nice treat for breakfast or a snack. My husband loved them too! I was so excited to stumble upon your website. I have a 7-month-old baby boy and was thinking about doing WW to get rid of the baby weight. Now that I found your site, I am more motivated to get started! With so many fabulous recipes, it will make the transition back to healthy eating a lot easier! Thank you for sharing a part of yourself to help others. I made them last night and we ate them for breakfast this morning (stored in refrigerator), so 10 seconds in the microwave and some whipped cream on top for the kids. They were a big hit! I’ve made this recipe a million times, and the timer just dinged “done” on one-million-and-one. I made this for Christmas breakfast so we can start the day with something delicious, comforting and even healthy! Cheers, Emily! Emily, just made these muffins. They came out mushy. I did swap the skim for vanilla almond milk – not sure if that would make them a huge difference. They taste great just mushy! If you can think of anything let me know. Thanks! Hm, that’s strange! It could have been the almond milk (I’ve never cooked with almond milk before). Maybe just use a little less next time or bake them for a bit longer? I’m glad the flavor is good! May I ask how many points would this be with out the chocolate chips please? Came across this wonderful recipe while looking for some wheat free breakfast options. I reduced the sugar to 1/4 cup and think they are still nicely sweet. Forgot the chocolate chips but don’t miss them at all. We are all in love with these muffins and can’t wait to try some other combos. Thanks for the great recipe. These look wonderful, as do the other oatmeal ones! I am going to make both the pumpkin and blueberry ones today!! How many PT’s without chocolate chips? I just made these. They are fabulous! The Smartpoints amount is 5. I think the Weight Watchers formula has changed in the past year or so. Anyway, I ate one fresh out of the oven, and it was sooooo good! Hi Shelly, I’m glad you love them! They are still 4 smart points in the recipe builder, I just checked. If you are trying to plug the nutrition information into the points calculator it doesn’t always come up with the same results as the recipe builder because the recipe builder doesn’t count zero point foods (like pumpkin). Hope that helps! How do you store the muffins you don’t eat the first day? Refrigerator? Freezer? Room temp?